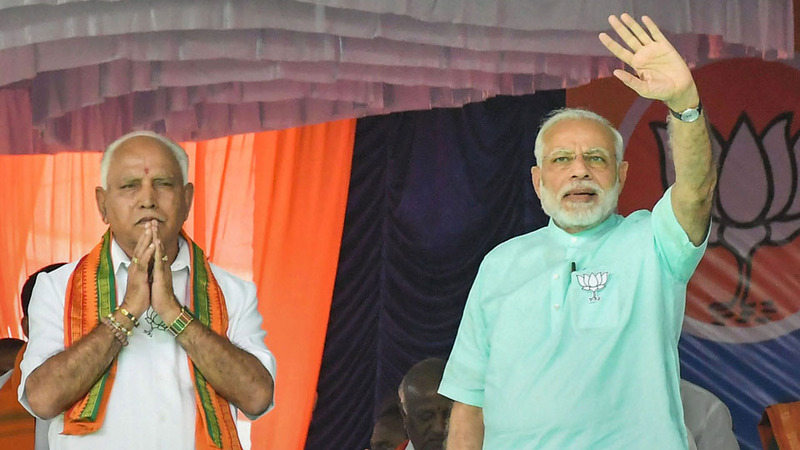 Bengaluru: The BJP appears to be in upswing in Karnataka encashing chiefly on ‘Narendra Modi factor’ as also the shift of Lingayat votes to the saffron party due to B.S. Yeddyurappa factor as most exit polls for the Karnataka show the BJP making huge gains. The predictions will not bring cheer to the Congress if it turns true, as it would set the tone for the next Lok Sabha elections where the Opposition plans a United Front to take on the BJP and have a bearing on its leadership role. The 2013 elections saw the Congress winning 122 seats while the BJP and the JD(S) were tied at 40 seats each. While four surveys have given BJP more than 100 seats but still falling short of magic number, ‘Today’s Chanakya’ has given simple majority with 120 seats. The prediction if comes true, the saffron surge will be immense as in 2008, the party’s best show in the southern state was 110 only. However, Today’s Chanakya prediction is with a rider that there could be plus-minus of 11 seats. For Congress, the survey says the party’s tally could come down to 73 from 122 in 2013. The survey gave JDS – 26 seats with plus-minus factor of seven seats. NDTV’s poll of exit polls showed both the Congress and the BJP tied at 94 seats each, thus throwing up the possibility of a fractured mandate. JD(S) headed by former Prime Minister H.D. Deve Gowda may still play king maker in the event of a hung Assembly. The survey by News Nation gave BJP 107 seats followed by CNX-106, Jan Ki Baat – 105 and C Voter – 103. However, surveys by Axis My India has shown that the incumbent Congress party will make it to 111 seats, while the poll of polls indicated BJP could win 99 seats followed by 88 of Congress and 33 by JD(S). According to Jan Ki Baat-Republic TV prediction, BJP’s tally has been shown between 95 and 114 and Congress share 73 to 82. The JD(S) could play a crucial role in the next government formation with the chance of making it in 32 to 43 seats. The C Voter survey has predicted that BJP will emerge single largest party with 103 seats followed by Congress with 93 and JD(S) 25 seats. The gains for BJP seems to be huge given the fact that in 2013 the Congress figure was 122 followed by BJP at 40 and JD(S) 40 and KJP and others 22. Political analysts feel that Prime Minister Narendra Modi, who addressed 21 rallies in 10 days, apart from being in close touch with party workers among youth, farmers and women had made a significant contribution to BJP’s groundswell. All paid service News papers and channels are giving BJP Punp where reality is far different ! BJP is lost and they had already tampered some evms in bangalore where they did the re voting! fake and cheat is the symbol of BJP and dumb bhakths ! All paid serviced News papers and channels are giving BJP Pump where reality is far different ! BJP is lost and they had already tampered some evms in bangalore where they did the re voting! fake and cheat is the symbol of BJP and dumb bhakths ! all paid services are giving hefty money to write such comments like you ? how much money you got to write against modi government. CONGRESS AND JDS WILL LOOSE HEAVILY ONLY BJIP WILL WIN WITH ABSOLUTE MAJORITY AND WILL RULE THE STATE FOR ANOTHER 20 YEARS EASILY. the tampering of election process was done by congress government all these years and modi has put a break for this. The voters options are very clear!